Winter Window will be available for purchase October 15th. CLICK HERE for further product details. Blooming Amaryllis will be available for purchase October 15th. CLICK HERE for further product details. Say it Simply: Merry & Bright will be available for purchase October 15th. CLICK HERE for further product details. You have until 7am ET, October 14th to leave your comment and be eligible to win. Only one comment per person please. One randomly selected winner will be posted on the October Release Winners Page by 10PM ET on October 15th. Winter window is a must have! How lovely this release has been! Definitely one of the nicest window stamps and die I’ve seen. Love all of the ideas on how to use it, too! I love the stamping on the ornament– great for those of us who are a tad too impatient to stitch a whole set. 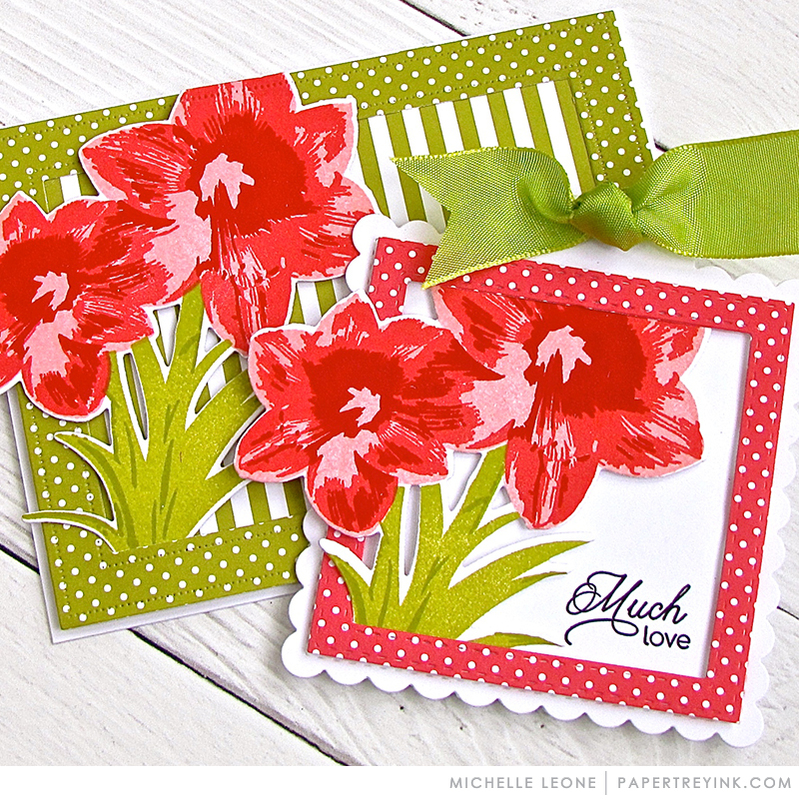 Love the window stamp and die set and the amaryllis stamp and die set. Winter Window is versatile and I can see using this window for all seasons, with the appropriate stamps. 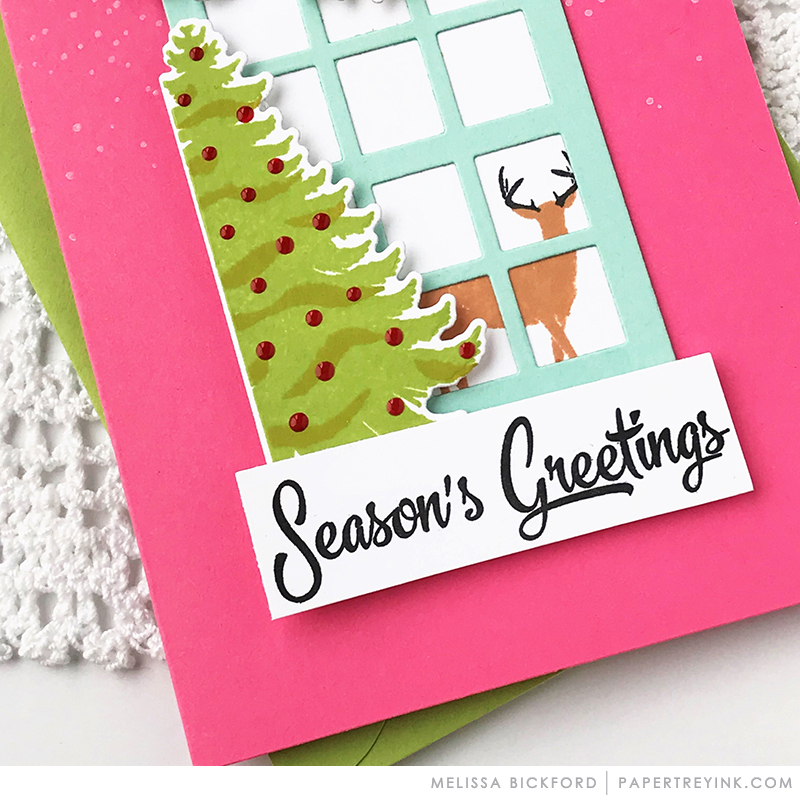 The window stamp and dies capture the joy of the holidays so perfectly. And that amaryllis-beautiful. SQUEAL!! LOVING the Release and ALL of the AMAZING Inspiration!! CAN’T WAIT to see MORE!! What another great release day! The window stamps and dies are fabulous! The window set and the bold borders die are a match made in heaven! Another release chock full of wonderful process! Well done, PTI! Love and would really like the snowflake stencil. Could you sell it separately? How are we supposed to choose? Guess I’ll just have to order everything!! Love the new winter window! This is such a fun die to create with! The amaryllis stamp is lovely, I have them in my garden. I thought my shopping list was DONE…. till I saw Winter Windows! It’s darling – and so many ways to use this set! Fabulous and unique designs and color combinations!!!! Can’t possibly pick a favorite!!! That window is so cool! Winter Window is a great addition to the collection and has such potential for year-round use! Winter Window….not too tall, not too wide, not too detailed, it’s just right! An absolute staple for our stash. Love the font. Definitely going into my cart. Love the window and the fact that you can make scenes looking both in or out… the flower is gorgeous too! The Winter Window set is adorable. Fabulous new stamps & dies! Winter window is such a fun concept for a stamp set! Also love Dawn’s amaryllis set!! Those Amaryllis are so gorgeous! Love seeing them in gold and cream colors, too. Beautiful work by the design team. Oh my I love the window. Again all the projects are amazing… loving the release. Always fun to see new items and projects! Such beautiful projects! Love the versatility of the window! Beautiful new stamp sets today. I love the window scene and the amaryllis. Wow!! I was very excited to see a window in the sneak peek video and the reveal has not disappointed at all!! I love it! I love all of the layers included and the details! Definitely a must have! Fabulous projects today! The multi-square window die is beautiful and very original! Simply love everything shared today! My poor shopping cart is going to be full of new items! Great release and the most beautiful projects by the design team! Another day of inspiring Christmas projects! I love the winter window cards and stamp set! Beautiful inspiration! Beautiful projects and amazing products! The window is super fun and creative! Blooming amaryllis has special meaning for me at Christmas. The huge blooms are magnificent and the stamp set does them justice! I absolutely love that winter window! Love the amaryllises! Nice twist to the usual poinsettias for the holidays. I always love window scenes on cards, and the amaryllis set is beautiful! Thanks for the chance to win a gift certificate. It would be very well used! The window stamp set and dies are terrific. The samples, as always, create a desire to have these new products. What fun today! The window scenes are just so sweet! Love the Winter Window set! Possibly spring, summer and fall add-on sets later? I can see all the seasons through the window! Really loving the window die and stamp set. Some great images to make different scenes and feels to those cards and love the big sentiment die too! So much inspiration! I am going to have a hard time choosing but I got so much use out of the orchid, I know that Amaryllis is staying in my must have list! 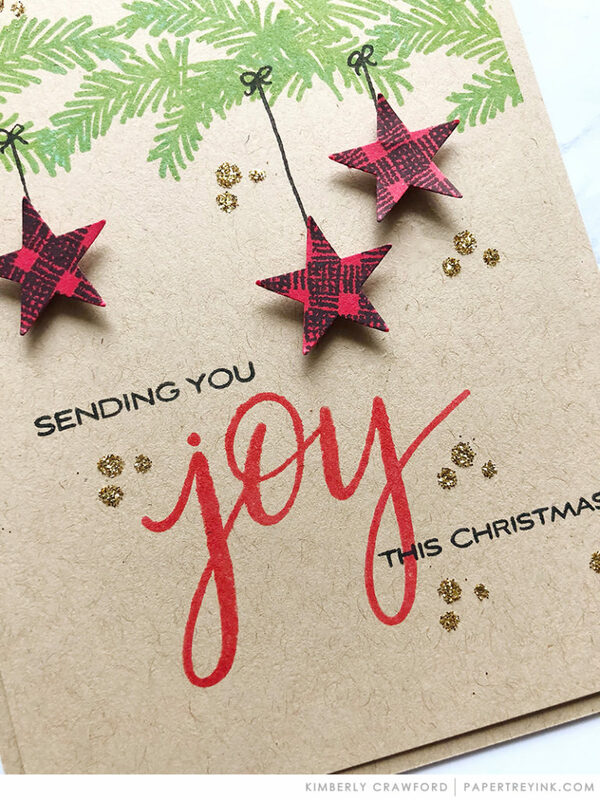 I just love the merry and bright die, it’s a must have. Loving the window set and the other sets that were used along with it! LOVE that stunning amaryllis! The cards created with them are so beautiful! Love the window. Think it will be good for all seasons, not just winter. Glad the 15th is almost here. Wow, love the window set! I am in LOVE with winter window! And I am thinking about all of the “non” winter uses, too! Wonderful! Love all the different ways to decorate the window. The Winter Window cards are beautiful! It’s fun to see so many older stamps and dies to use with the window theme. And the amaryllis looks lovely in every color combination! Oh, my! I love everything introduced today and the cards are magnificent! Just gorgeous! Thank you to the design team for all the beautiful cards. As always, the DT has done an outstanding job of showcasing today’s products. I especially like the non-traditional colors used aon some of the projects. So happy to have a PTI window stamp and die. Endless possibilities! Wow – so many beautiful products this month! I want one of each! Everything today is just amazing. My list grows as the DT projects make me want it all. The design teams’ creations are stunning. I’m winterizing my craft stash with this release. Oh my! That amaryllis is absolutely beautiful! And how can anyone not love the window set? Everything today needs to go into my cart! WOW each of the Design team has provided so much fun inspiration. This release is one of the best. I think Mr. MoJo arrived ! Wow, what an amazing release! Holiday card making needs to be all year long to use so many inspirational products. Oh, what will I do? Loving the window, the Amaryllis, and Kimberly’s pals Stars! Wow, beautiful cards by the designers. Love all the new products. The window stamp and die set has sooooooooooooooo many possibilities! And not just for the winter season! Winter Window would add so much to my stamping supplies! LOL It’s a fun set year round with other products. WInter window is a must have. I am in love with today’s projects. Wow! That amaryllis flower is out of this world, and the window so cute and clever. Completely awed by all the beautiful cards today. The window, the amaryllis, 2 must haves! Wonderful window set and loving the amaryllis too! Beautiful new stamps and dies. It just keeps getting better and batter! Loving this release! Wonderful window die. Another day filled with great cards from the design team!!! Amaryllis was a favorite of my mother. I am using Melissa’s card as my inspiration for Christmas cards this year. And the window options are amazing. I love Winter Window and Blooming Amarylis–both are beautiful! Wonderful holiday posts! That window is added to my list. Love it! 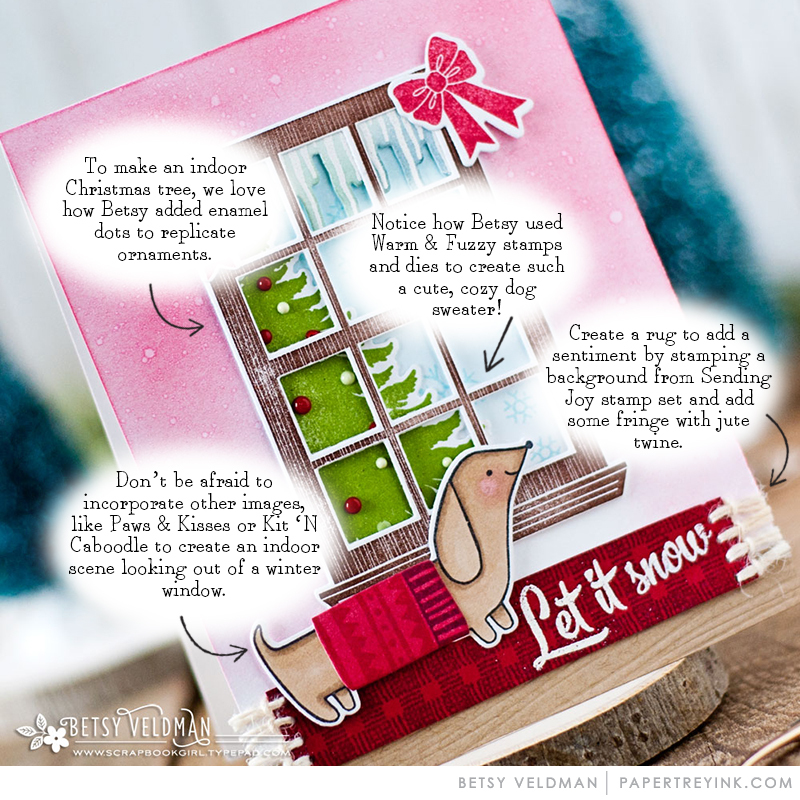 The window stamps and dies are to DIE for—love the ideas shown! I’ve been hoping for a PTI window for so long! I love the window frame. I can see using it throughout all the seasons. Thanks, PTI! Blown away by the Amaryllis designs!!!! Seriously gorgeous cards by all! Thanks for the wonderful designs and great project ideas. Another fabulous release day. I love the winter window. So many ways to use this all year. Wow. Thanks. Everything being shown today is wonderful! I love the amaryllis the most! Betsy’s use of stencils over painting has got me thinking. Thank you. Hello PTI I love each and every set. You always out do yourselves at Christmas!! The window set is so clever! The window is wonderful! All kinds of ideas!!! Love the Winter Windows set and the scripted holiday word die! Winter Window is a must have for sure! I’m in love with Winter Window! The Winter Window and Amaryllis sets are FABULOUS…must haves!! And such lovely, lovely cards from the DT today too! OMGoodness, love everything! It is all so lovely and the inspiration is fabulous! Wow, both of these stamp sets are gorgeous! I love all the examples from the design team, they all rock! The winter window set can be used through February and the amaryllis set looks so realistic! Love!! That window! So cute! And I can never resist a floral set – love the Blooming Amaryllis! The window set is amazing! So fun and different. I love it. Beautiful winter window! Going to be difficult to make choices this month! 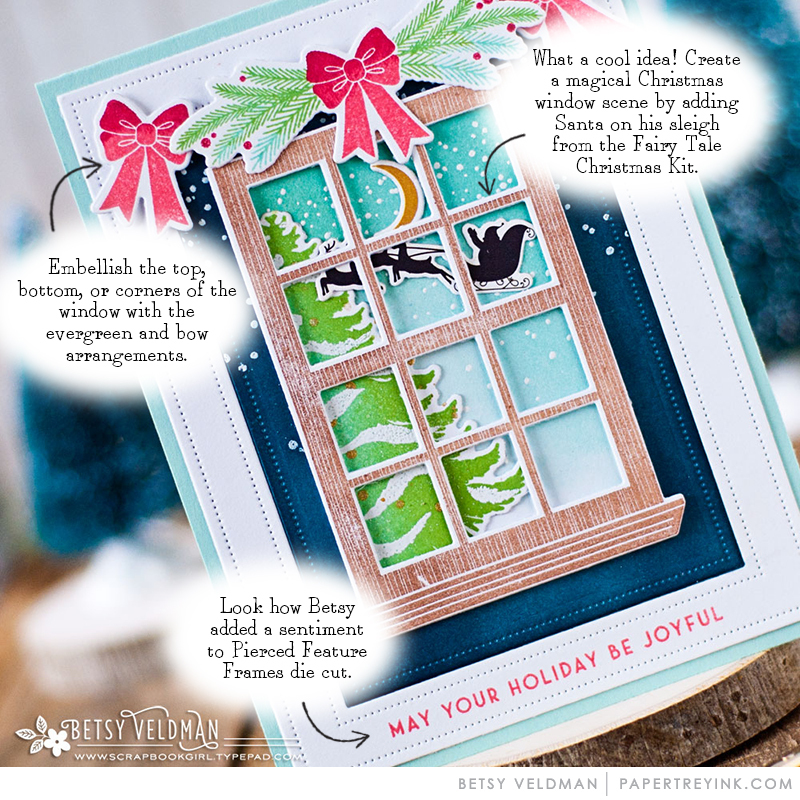 I LOVE everything about today’s peek…especially the window set…and that Betsy is SO creative in how she uses past sets in new ways! I love the concept of the window on cards and tags, that could be used in so many ways! What a wonderful framed window – SO fun that it can be a shaker! Beautiful inspiring samples from the team! The Window stamps and dies are delightful. Such great inspiration with all the new products revealed today. Oh. My. Goodness! These release date are an absolute feast for my card-loving, Christmas-loving, color/winter-loving eyes! Dawn, the candle in the window! Heather, always beauty on kraft! 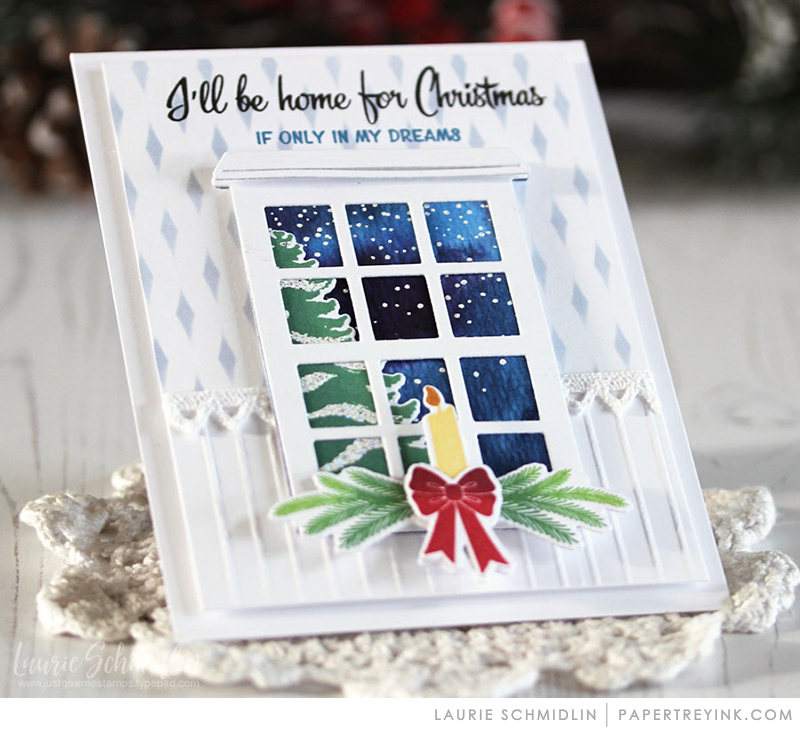 Laurie’s sentiment from one of my favorite Christmas songs! Lizzie’s sentiment in berry sorbet, my favorite color in the world! Melissa P’s golden glittery flowers! Melissa B’s deer in the window! Love! I’m over the moon with Santa for this release! I don’t know how the designers keep out doing themselves, but they do! I LOVE EVERYTHING! I love to create for Christmas. I can tell you guys do too. Beautiful. Year after year, PTI outdoes the previous releases with even better holiday stamps and dies! I am loving today’s projects and have to say PTI designers – you are the very best!! You kick it up a notch with every new product! SO much inspiration makes my head swim. That window is so versatile, and I really love those flowers. My oh my! The window, the amaryllis. Everything is just lovely! Your post today just takes my breath away! Gorgeous, gorgeous! Your team is so inspiring! Love the windows! 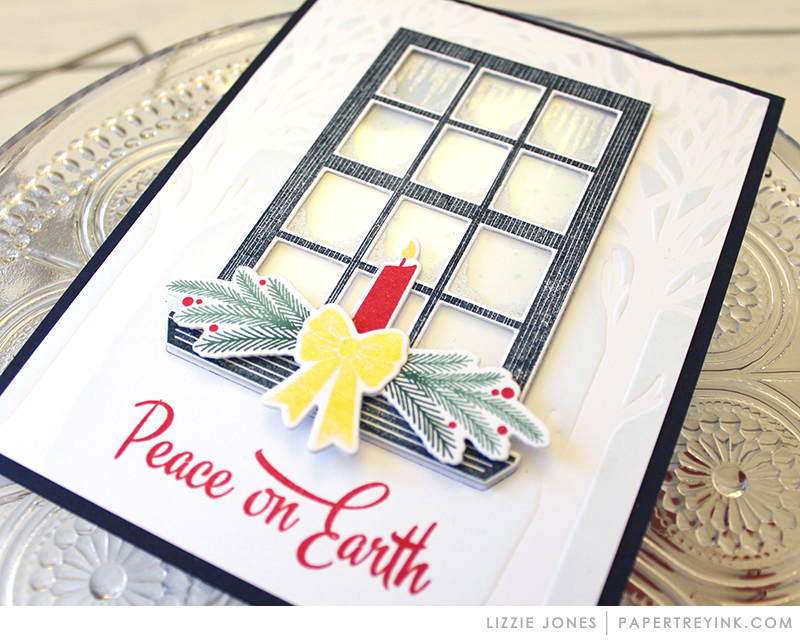 The Window stamps and dies are beautiful, and seem so versatile – love them! Winter Windows is amazing! Love! Love the Winter Window! Fabulous artwork as always design team! Appreciate the additional tips too! Amazing projects! I love the new window die! Winter Window is so lovely! It can be used year round for so many occasions! Fabulous release! I really like how the designers are using printed papers in their cards – so much inspiration to give me the ‘I wants’. Winter Window is a must! Love all the examples from DT! Especially the pup and rug! I still have items on previous years’ releases that I haven’t even gotten around to buying yet. My wish list will just keep growing. I love all the possibilities with the window set. Great addition! Another amazing day for this release! Everything is a must-have! Love the Winter Window! and the simplicity of Merry and Bright. 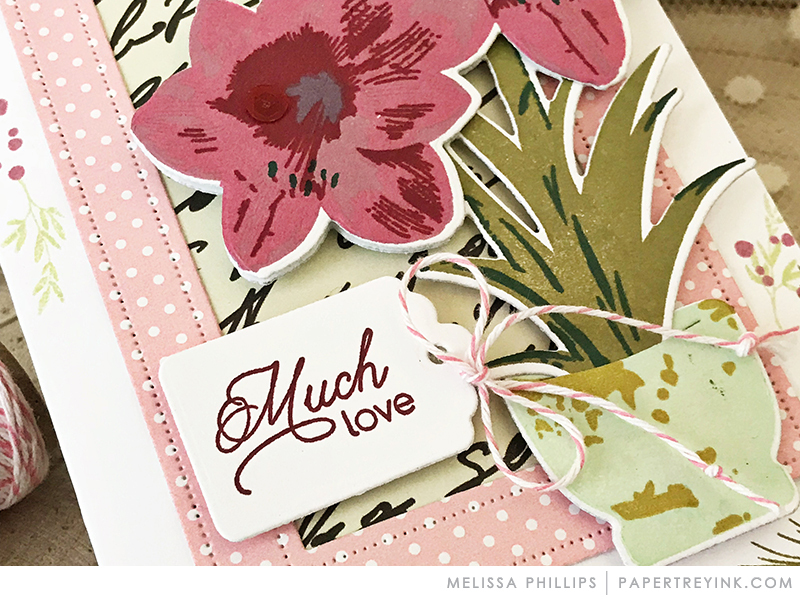 I love the Amaryllis stamps & dies! So gorgeous! 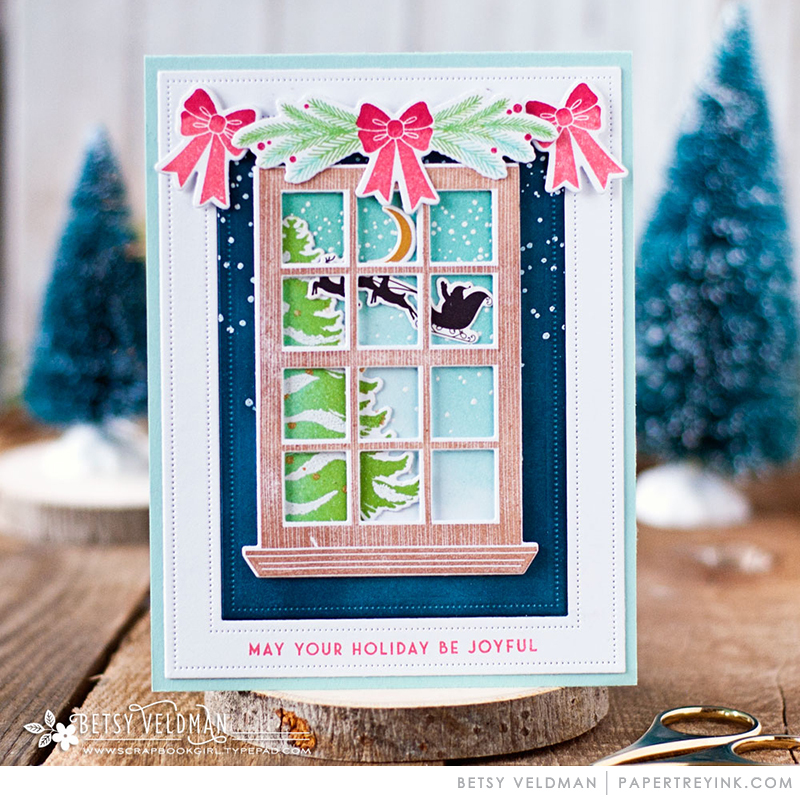 The window stamps & dies & large Merry & Bright dies are fabulous too! My must-have list is growing! Thank you DT for more great inspiration! Lovely and creative samples using winter window, all of which have inspired me! I love the amaryllis, I always have these at home and at work in the winter! All the window card ideas are so cute! Can’t wait for Christmas. Love all the festive cards with that window! Will look forward to seeing this window through all the seasons!! I love these beautiful amaryllis and the window is stunning and versatile. I love the window cards with Santa outside. The other cards are very nice also. The winter window is just too adorable! So many ideas running through my head. I love Winter Window, such a great idea!! And the amaryllis is absolutely Beautiful!! Another great release PTI!! I love the candle in this set. Dawn’s flowers are beautiful as well. Such beautiful samples! Love that window! Winter Window is an amazing set, with all the right details included! And the designers’ cards are wonderful! Love all the window scenes! I love everything especially Blooming Amaryllis. They are beautiful flowers and the stamp set did a wonderful job capturing that. Love the window stamp, absolutely beautiful and versatile! So many wonderful new products and great ideas! Can’t wait to work on holiday projects! These cards are gorgeous! Loving all the window scenes! All the cards using winter window are sooooo creative! Love it! Wow, the DT knocked it out of the park today, the creativeness for Winter Window is amazing! Love Blooming Amaryllis is gorgeous and classic. Looking forward to the release day! Winter Window is adorable. LOVE all the ways it can be used. Dawns Amaryllis is SO” pretty!!! Winter window is beautiful. Love all the gorgeous cards. Such a huge variety of designs from such an inventive release. Can’t wait till the 15th. Fabulous cards and all so festive. Love is new release. 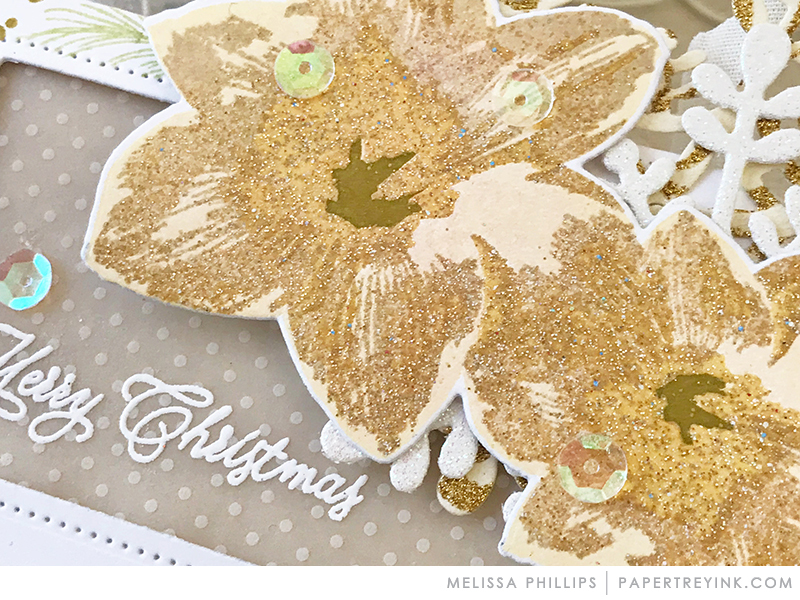 You got me good with Melissa’s sweet Folded Gift Tag and gold/glitter embossed Blooming Amaryllis!! Love those soft colors!! Just when I think they can’t get any better, you prove me wrong. Love, love the winter window set. Another one going in to my cart! Winter Window is jaw dropping amazing!! Wow! Must have the window stamp and die. Love the winter window! Will be a great scene builder all year round, and I’m sure we’ll see more stamp sets incorporating this great new addition! Love the window stamp and die set. Very pretty. All the trimmings that go with it are a beautiful touch. These are lovely cards and getting me in the mood for Christmas! LOVE!!!! the winter window, perfectly sets the scene for a winter wonderland. The Amaryllis is beautiful too! Winter Window creates such cozy scenes! I love it! I love everything I’ve seen today! So gorgeous! 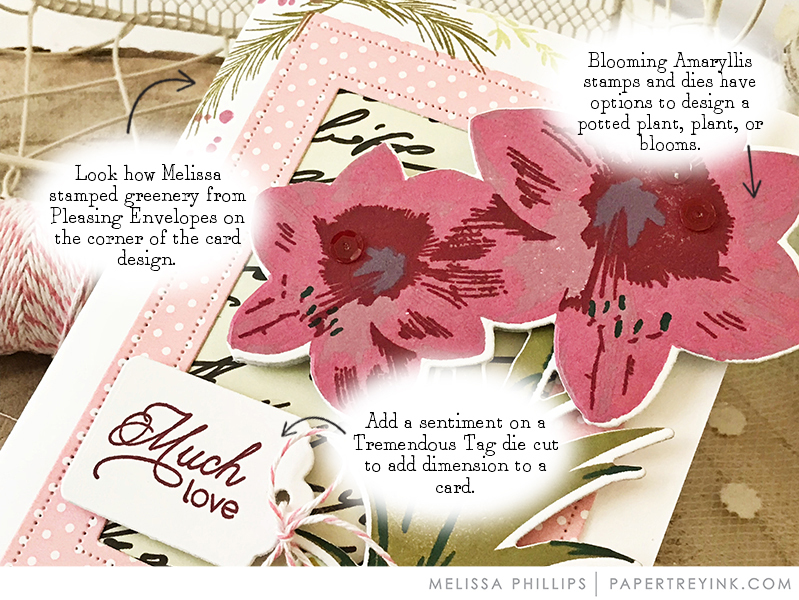 Dawn’s Blooming Amaryllis set is gorgeous and Melissa’s cards using it and so inspiring. Love love. Just loving so much from this release. I’m feeling very excited about the holidays. Wow, such beautiful inspiration from the design team. The Blooming Amaryllis is gorgeous! And all of the window scenes are so fun! Me encanta ver la diversidad de sus creaciones con un solo set de sellos. Wow!!! What a beautiful inspiration!!! I love so much Winter Window. It’s a very versatile set!!! It’s already on my wishlist! Just when you think you can’t have another flower in your stamp collection, then the amaryllis comes along! Love this set! Loving all of Dawn’s new products this month, so glad she is back!! All of today’s cards are gorgeous. I just love the window. The cards almost make winter seem like something to look forward to! Love the windows and amaryllis. So many possibilities with that winter window die! Great job from everyone! So in love with Winter Window! Reminds me of Christmases from my childhood as I would look out and watch the snow fall. More gorgeous goodies. Each new release is so unique and lovely. Beautiful day 4! The Amaryllis is stunning! Way to go PTI! Yikes! So much goodness with this release, it’s difficult to narrow it down. Love seeing the gorgeous creations by the DT! 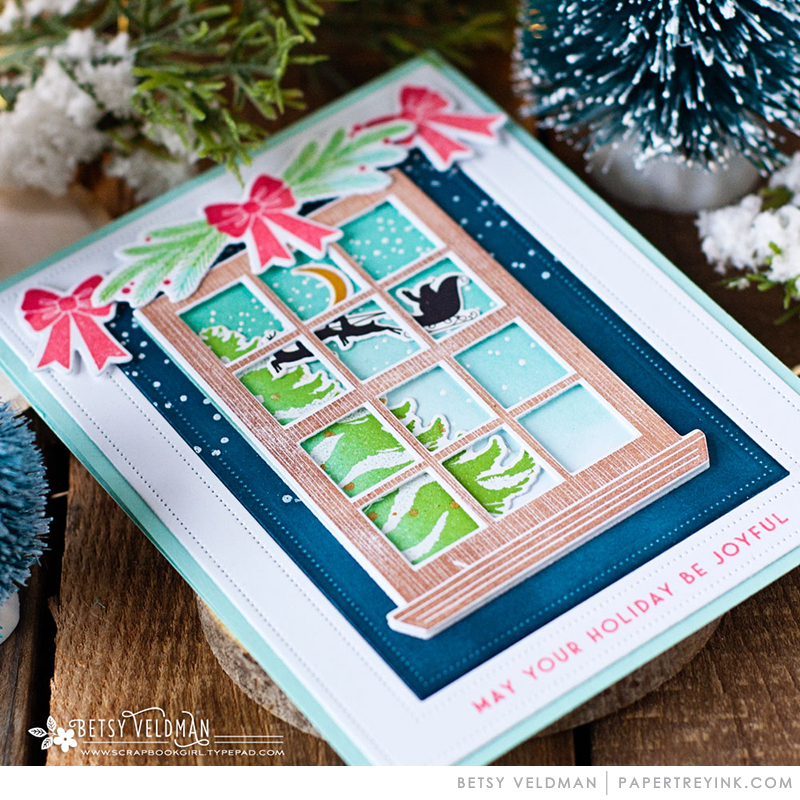 Love the beautiful cards the design team did with Winter Windows! Winter window is a must-have! Gorgeous! I love the use of the Fairytale Santa and sleigh! Love, Love the Winter Window Set…….so many possibilities!! Definitely a “must have”!! The winter window set is amazing! I absolutely love it! 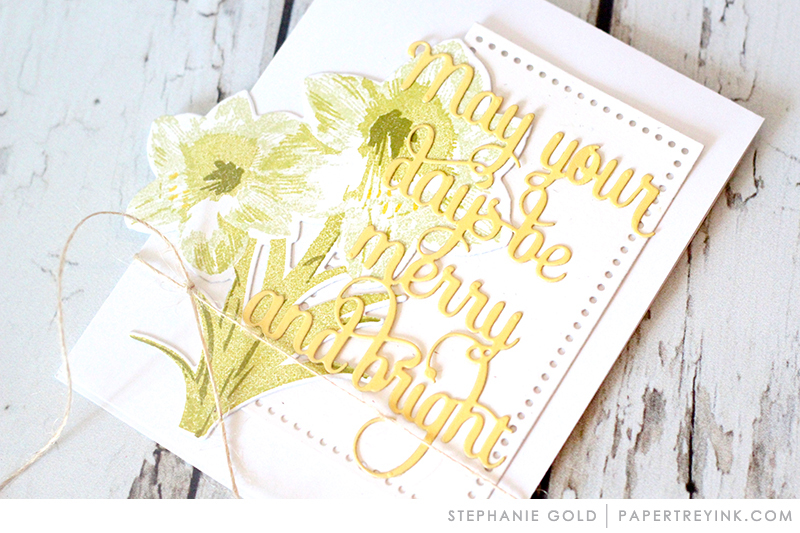 Very lovely cards… especially the gold amaryllis card! Another fun morning filled with lovely holiday projects. Winter Window is perfect in every single way, my favourite of the day! My list is growing and growing, grrrrrr. The Winter Window is adorable. Love it all today! That window is amazing and I can’t wait to see the whole set! The amaryllis is beautiful and so detailed. The projects today are amazing! The window is such an iconic image for Christmas… I love it! The Winter Window set is amazing! Fabulous cards today….they are all so beautiful! Love the Winter Window especially!! That window is wonderful. So many possibilities. Beautiful amaryllis and I absolutely love the winter window. Endless possibilities of what one could create into the world outside. LOVE the Amaryllis and the Winter Window sets and dies! LOVE all your beautiful projects! So many different variations. I am hoping you will continue with the Window set and come out with the different seasons and various additions! Winter Window is a great new addition to PTIs offerings. Great samples today too DT! WOW! I am totally in awe of these gorgeous cards today. I spotted the The Winter Window and beautiful Blooming Amaryllis in the sneak peeks and knew immediately I had to have them! Hoping I can get my order in before they are sure to run out! Love all the wonderful ideas using the Winter Windows set! Can’t wait for the release! Yep, that Winter Window is a winner! Window window is really nice. This set will make great cards. I love the winter window scenes. Betsy and Laurie really “knocked it out of the park for me”! For the second month in a row PTI gets my crafty money! Love it all!!!! The Blooming Amaryllis is beautiful. It’s fun to see the different color combo’s used on this flower stamp. Beautiful projects from the team ! I like the Window Winter Set ! The DT knocked it out of the park again! Simply beautiful! Just when I thought I could resist buying a lot this month, you come up with the winter window set and the blooming amaryllis plus dies to go with them! They are gorgeous and so versatile. What a great release! That window! Ack! It offers so full much creative potential! Loved all the projects shared today. Amazing projects! Love the Winter Window! I’m so excited for the window set and die. The amaryllis set is lovely. Blooming amaryllis is just gorgeous! Great projects from the DT. I want it all!!! This is the most gorgeous Christmas release and the team has done a fantastic job of showcasing everything! Every day I get more and more excited as you introduce new and amazing products and I see all the brilliant projects the designers have created. Love the winter window set with all the attention to detail, especially the snow on the windows. This release is just wonderful! So many beautiful products! I love all the window scenes!!!! Amaryllis is just beautiful. Love the cards that DT made with it. Such gorgeous images and so much inspiration from the team. 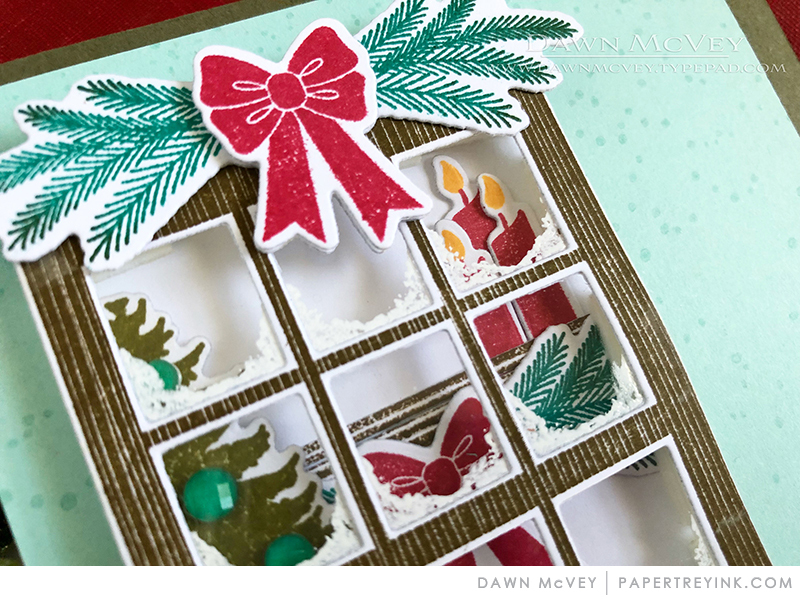 Loving all the beautiful details of the window set & all the options for creating scenes with the stamps & dies. Love the amaryllis. So realistic and lots of fun options too! Such a pretty window die and those flowers are gorgeous! Beautiful products and gorgeous inspiration! I just can’t stop thinking about that window! Love everything about it. You have created great winter window scenes! Very beautiful! Love the inspiration cards & the products as always are wonderful. This is so wonderful…love this gorgeous window and all the incredible scenes behind it. So magical! Winter windows is so versatile – I love all the creative uses! 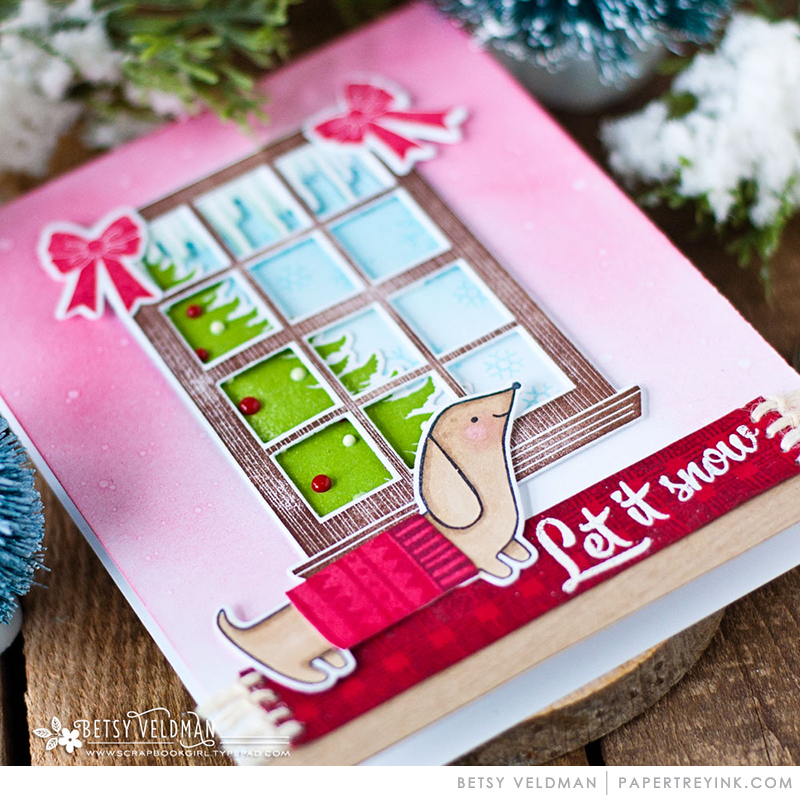 Love the Winter Window stamps and dies. What lovely the designs the team came up with. Really beautiful. Today’s design samples brings back memories of childhood when my family and would walk the neighborhoods looking at the single or 3 electric candles in the windows Those were simple simple days and Grams always had cookies and cocoa when we returned back to her home. Thank you for the memories. I love all of today’s new items! So fun! 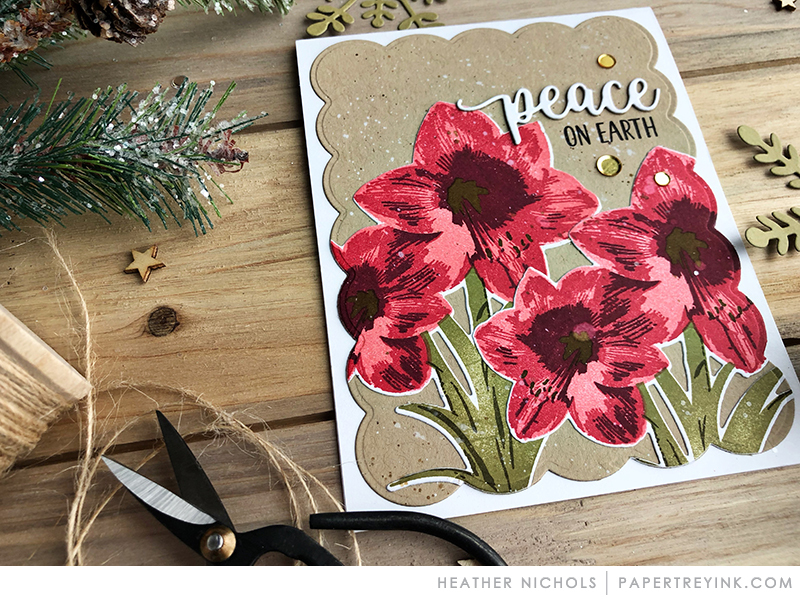 I wild about flowers so I’m delighted to see the amaryllis…and the merry and bright die will make a quick but stunning Christmas card! 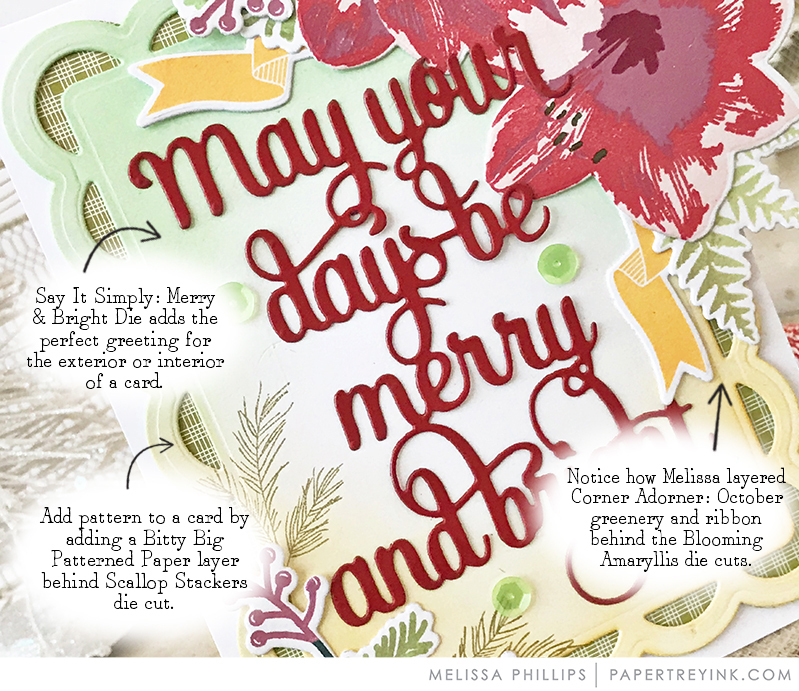 Another great peek at the stamps & dies, Dawns Amaryliss is gorgeous as is the Window stamp & die set. Can’t wait for Monday evening! I love Winter Windows! The perfect size & the DT examples are absolutely beautiful! Can’t wait to get this one! You guys are killin’ my bank account here! Love, love winter windows. Love the window. Very clever concept. Maybe I’m too easily pleased, but, my favorite things in this whole post are Kimberly Crawford’s buffalo plaid stars! WOW!! Gorgeous products and projects today!! 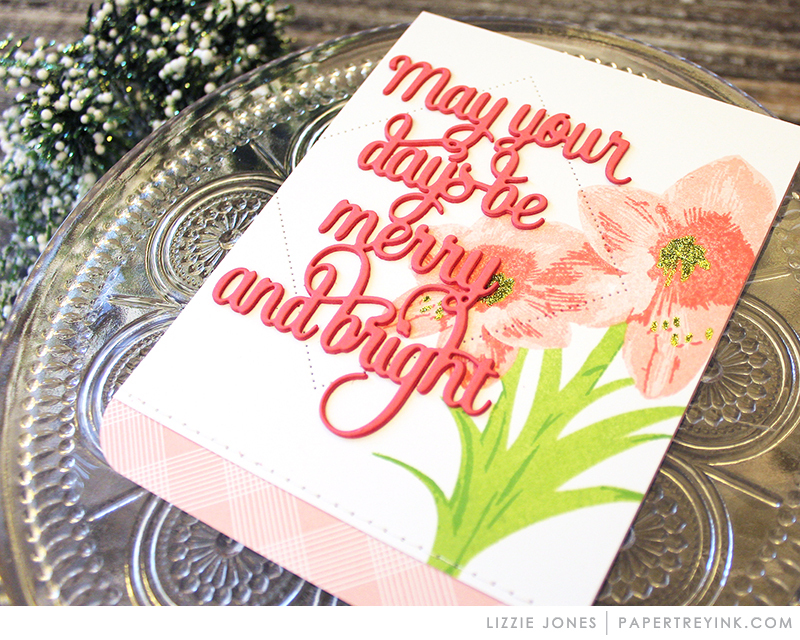 The amaryllis is beautiful, the window die is awesome and the die cut sentiment is perfect for easy Christmas cards!! LOVE LOVE! Everything is fun today, I especially love Winter Window. I am thinking about several different versions of a card using it. That window and the amaryllis are must haves. Love today’s Christmas goodies. Adorable window design!! Love the samples 🙂 Also really appreciate the large die cut sentiments!!! Winter window scenes are iconic and I love all the festive versions that team came up with! 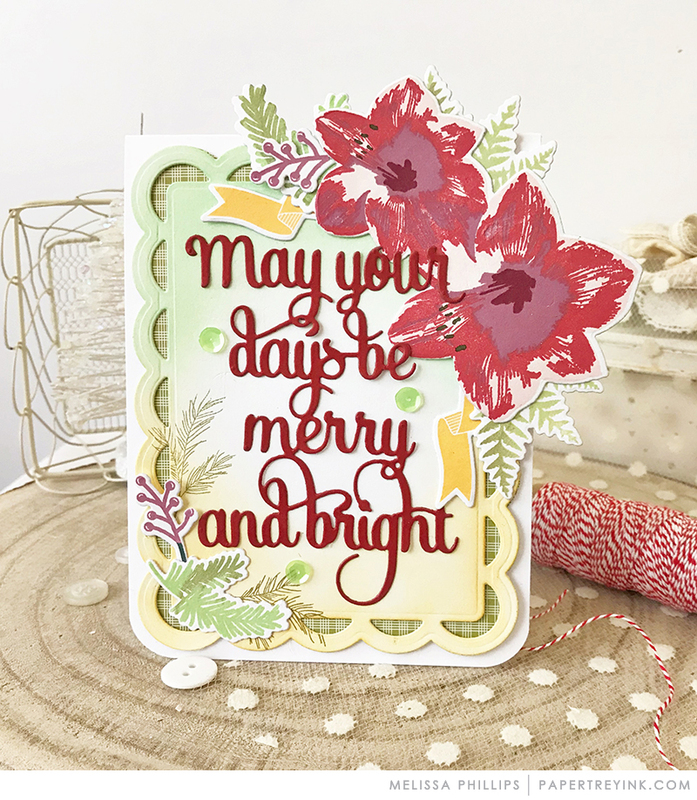 Loving Dawn’s big scale merry and bright sentiment so striking and wonderful for quick Christmas cards! The amaryllis is so beautiful. You make it harder every day to decide what to buy. Another day of beautiful samples. Nice job by the design team again! 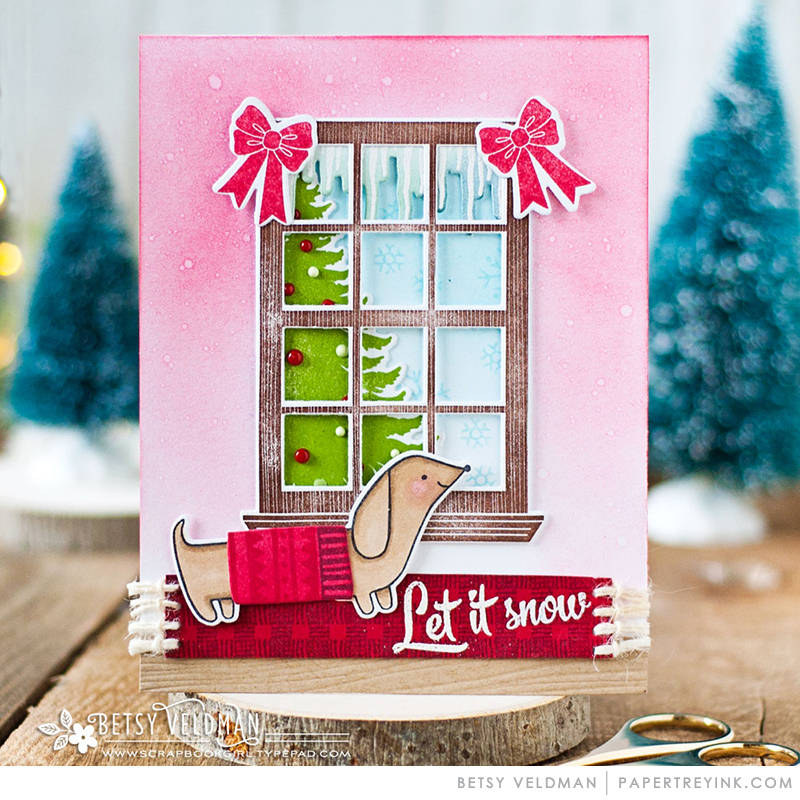 You can always count on Betsy for some fabulous dies and Melissa’s sample is gorgeous! The amaryllis stamp is stunning. Loving this month’s release. I love the window die — for sure on my wish list! I absolutely LOVE the Winter Window turned into a shaker! Brilliant! Love that window set – so many cute projects! 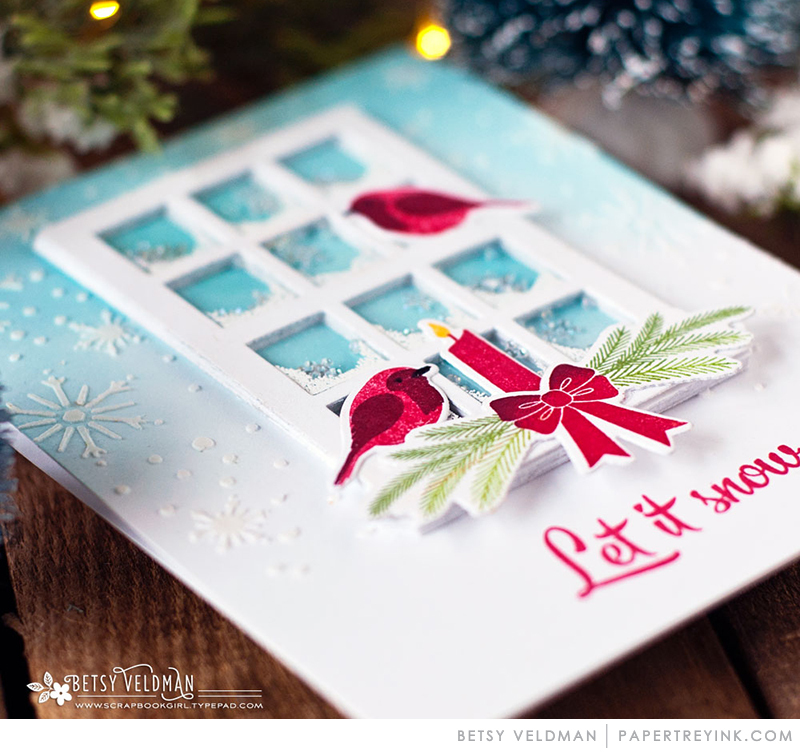 It was difficult to scroll past Betsy’s window cards, they are all so pretty! 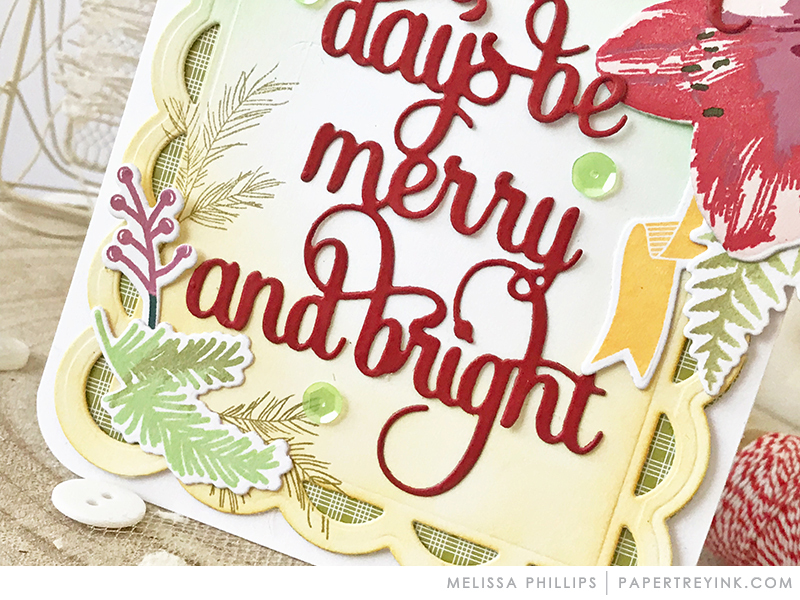 Melissa’s cards are always a joy to behold as her layout/design skills are unparalleled. Another day of too many things to add to the wish list. Oh! I love all these window scenes so much! So beautiful! Love the Winter Window set, especially with that adorable Santa flying by. I love the new Winter window stamp and die set, there are so many ways to decorate the window. I´ve already a lot ideas! The Winter Window set is awesome! I can see lots of possibilities with it! The Blooming Amaryallis set is gorgeous! Love this window stamp ! Beautiful stamps and dies today! That amaryllises are so pretty! Love the windows and all of the flowers are so beautiful. Gorgeous work team! Betsy’s projects of Winter Window are so Realistic!! What a neat window stamp and die set. Up till now, I’ve only seen windows as either one or the other, so good for PTI to offer both! Love the Winter Window set! Beautiful designs! WOW, love everything about this release so far. 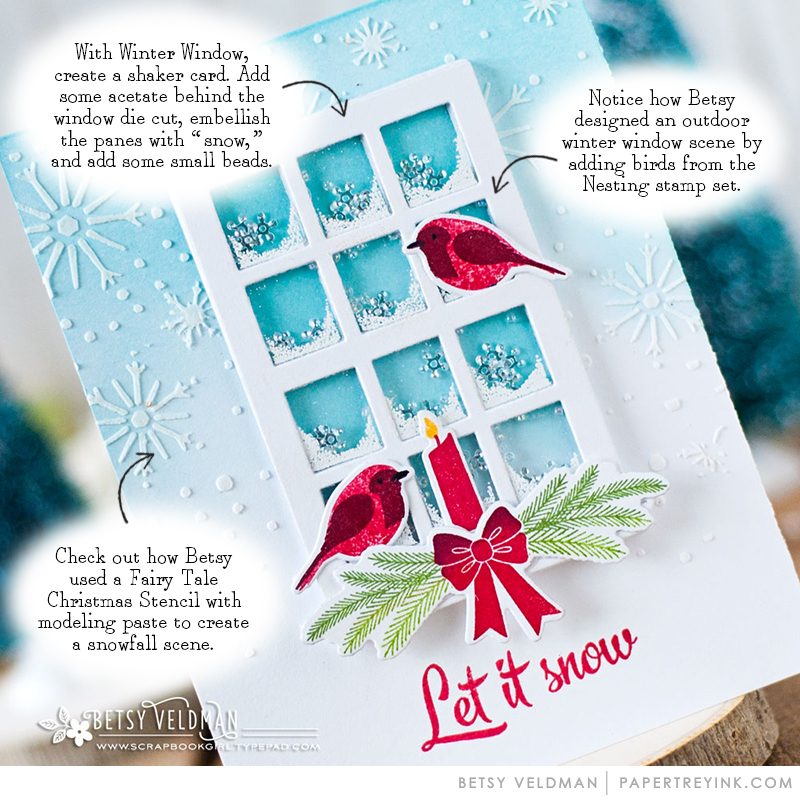 The new Winter Window stamp and die set would create a great focal point for cards and would make beautiful shaker tags too! 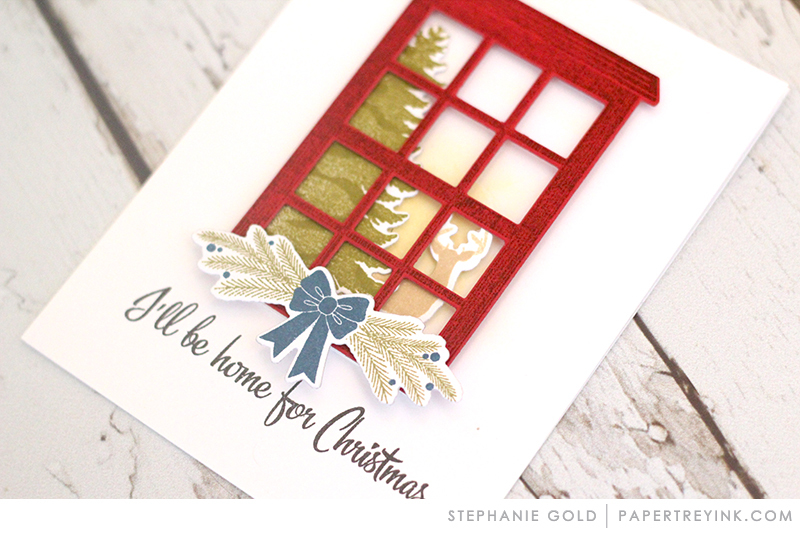 Love the window & the font for the sentiments! Great release as always! I can see so many possibilities for Winter Window! And I love the October corner adorned. Great release! Think I’ve got the have the Merry & Bright die. So easy to use it to pull together a beautiful card. So many lovely products being released this month. What fabulous new products & lovely inspiration! The window scene cards are beautiful! I would definitely love that for my Christmas cards. The Winter Windows are SO beautiful! Love the winter window! Very creative cards using it! Wow, so much detail on Dawn’s new Blooming Amaryllis set, so pretty! Oh wow, these winter windows are gorgeous!!!! Love the beautiful work from the team! Love the winter window scenes! Love the crisp, clear lines of the window die. It makes it so versatile and a great addition to anyone’s craft collection. 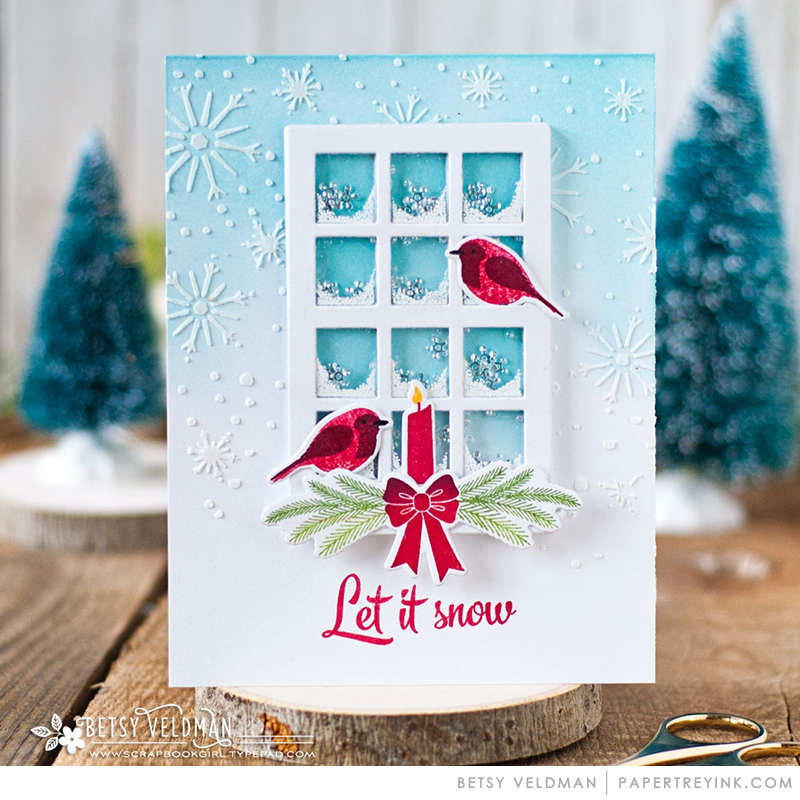 Oh the winter window scenes are beautiful card fronts! We all know a window can carry many a scenario…this is going to be fun! Another day of wonderful products. Can’t wait to see what’s next. The window dressings for Winter Window are wonderful! Winter Window looks like a “must have”! Oh my goodness! What wonderful products & projects! More amazing products and inspiration! 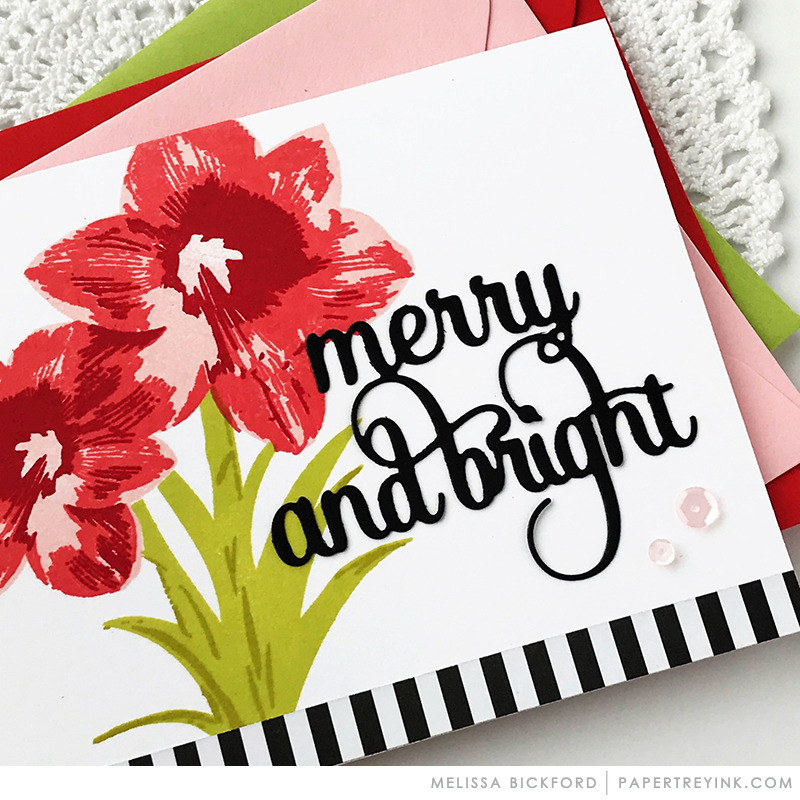 Love the Merry & Bright sentiment – the font and size are so fun to fill up a card. Love your window scene and the beautiful amaryllis! The candles in the window are so festive! Beautiful cards! I love how creatively the team used the various sets, so much inspiration! Ohh dawn always comes up with amazing florals! Here’s another one. The winter window is a must have too. Great job on all the samples ladies! Winter Window is stunning! Blooming Amaryllis is stunning, and such beautiful inspiration from the team!!! Say it Simply: Merry and Bright is so beautiful! I love all the projects with it, especially Stephanie’s soft colors!!! I adore all the products featured today but Dawn knows the way to my heart it seems since I love flowers almost as much as she does. This set is absolutely gorgeous! The Winter Window is my favorite today. Love Betsy’s shaker card with the snowflake background! thanks! 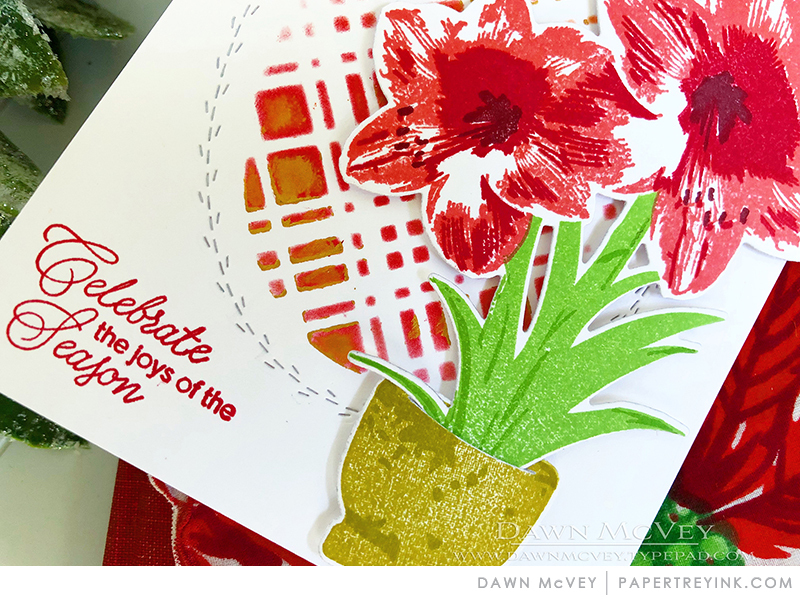 The amaryllis Stamp is gorgeous! I love the snowflake cover plate die cut. Another great release! The winter window is amazing. I love all the different styles the design team created to inspire us. What charming and magical window cards! Blooming Amaryllis is lovely and Winter Window looks great! Wow, the window set is amazing and the amaryllis set is gorgeous! Thanks for all the inspiration! Love all the stamps and dies in this months release! Fabulous inspiration from everyone. I really like the snow look in the window frames! All the cards are a dream. Such great ideas and inspiration. So many possibilities for that window! Ohhhh my goodness. That little weiner dog cracks me up. I don’t know what set it will be part of, but I have to have it. He makes me squeal with glee and happiness. I love the window die and stamp set. Oh! What wonderful holiday window scenes. Just amazing inspiration! Happy Holidays! I love the Winter Window set! It’s so versatile and it can be used for other seasons, as well as winter! Love Winter Windows! 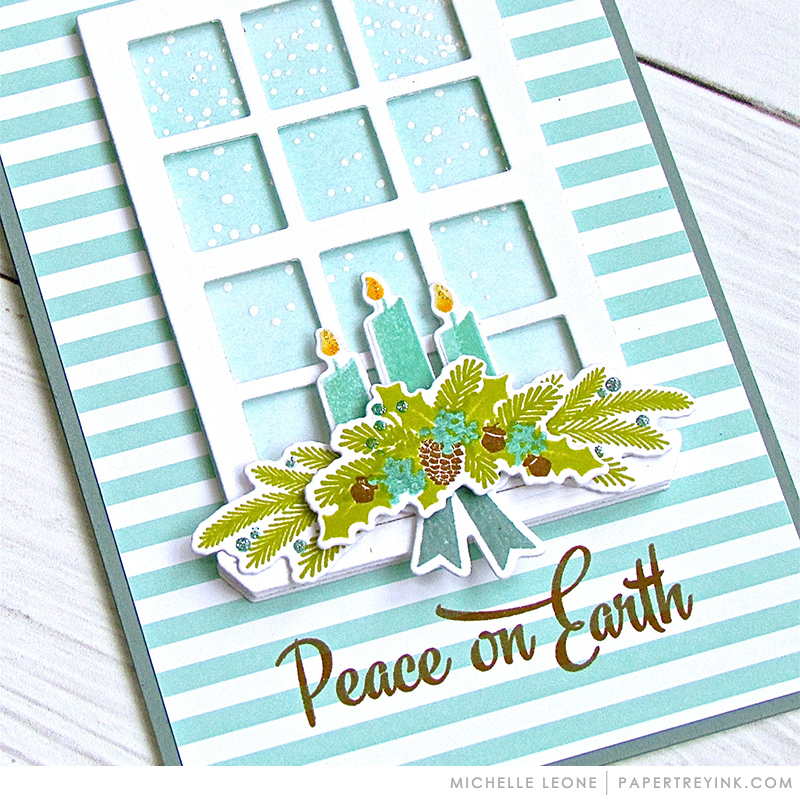 My favorite card is Michelle Leone’s with the candles in the window! The DT has outdone itself once again. Another day of wonderful creations from the DT. How fabulous is that window?! Too cool! Oh! I love the window. Such a versatile and creative item. Thanks! Ooo!!! The amaryllis!!! I love those!!! This window is great. The possibilities really are endless! Love that beautiful Amaryllis plant and the window die is perfect for so many different scenes. Awesome releases this month! All the projects for Winter Window are so pretty! I love it! Winter Window is so versatile and I love the Blooming Amaryllis! So many cute ideas with the Winter Window! Such lovely projects by all! All the projects are gorgeous! This release is so beautiful! What’s not to love about the Winter Window! So cool! So clever how the different winter window scene were created. I also love the blomming amaryllis stamp. I have this plant in my garden and it has the most amazing colors! You had me at “Winter Window” <3. LOVE! That Winter Window is just beautiful! The scenes make me want an old-fashioned Christmas. Betsy’s winter windows shaker card is the cutest thing. I’m reading up on how to use some of those ideas! My clear favourite today is the winter window set. So versatile! I am not ready to look out my window and view a winter scene, but, on paper, it is perfect. I love all the different looks the DT have created with Winter Window! Love love love the Winter Windows set and the Amaryllis too. Cant wait to play with them both! That Winter Window is so cute and could be used all throughout the year. Would love to see some additional holidays/seasons peeking through! Beautiful job Papertrey Ink. Oh my gosh those window cards are absolutely amazing!!! Winter Window is amazing! Love all the amaryllis projects too! The window has endless possibilities. That’s why I love your products. Great job on the examples. Winter windows is a must have! There are so many possibilities! I love how you can have the window looking in or out. It just adds to the versatility of the set. And I can see using this all year round. Just change the images and colors used! Love the cards today! And especially love the Winter Window set! Gorgeous sample projects! What a fabulous new release!!! So amazing to see the beautiful and creative uses of the new products! It’s all great! Love the window set! I hope there are more for other seasons. So much beautiful inspiration today!! Love the cheeriness of the Amaryllis projects!! And the window due is so versatile!! Gorgeous stamp sets and cards! Wow what amazing creations! I love the Amaryllis!! Everyone’s winter window scenes are brilliant! I love Melissa’s card using the Amarayllis. So pretty! The window die is beautiful and I am envisioning so many scenes to create! Winter Window is beautiful! It can be both rustic or elegant and used year round – that’s awesome!